This is an interactive timeline covering the history of cement and concrete. It spans over 5,000 years, from the time of the Egyptian Pyramids to present day decorative concrete developments. Concrete has been used for many amazing things throughout history, including architecture, infrastructure and more. Complete with photos and descriptions, this timeline is an informative and fun tool. 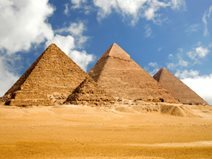 The Egyptians were using early forms of concrete over 5000 years ago to build pyramids. They mixed mud and straw to form bricks and used gypsum and lime to make mortars. 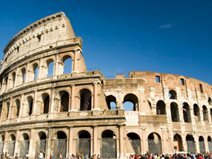 The ancient Romans used a material that is remarkably close to modern cement to build many of their architectural marvels, such as the Colosseum, and the Pantheon. The Romans also used animal products in their cement as an early form of admixtures. 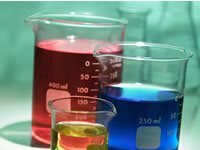 Admixtures, additions to the mix used to achieve certain goals, are still used today, read more about them here. Was Concrete Stronger and Greener 2,000 Years Ago? 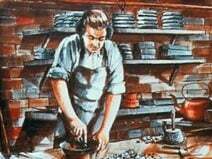 Joseph Aspdin of England is credited with the invention of modern Portland cement. He named his cement Portland, after a rock quary that produced very strong stone. Read more in Portland Cement--What Is It. 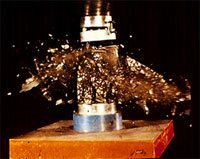 In 1836, the first test of tensile and compressive strength took place in Germany. Tensile strength refers to concrete's ability to resist tension, or pulling apart forces. Compressive strength refers to concrete's ability to resist compression, or pushing together forces. Both tensile and compressive strength are expressed in pounds per square inch (psi). Alvord Lake Bridge was built in 1889 in San Francisco, CA. This bridge was the first reinforced concrete bridge, and it still exists today, over one hundred years after it was built! In 1891, the first concrete street in American was built in Bellefontaine, Ohio. 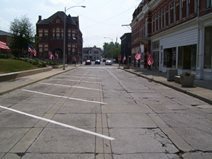 This is a modern photo of the historic street. Today, pervious concrete is being advocated as the best, and most environmentally friendly, surface for streets. The first concrete high rise was built in Cincinnati, Ohio, in 1903. The Ingalls Building, as it is called, has sixteen stories, making it one of the great engineering feats of its time. In 1908, Thomas Edison designed and built the first concrete homes in Union, New Jersey. These homes still exist today. Edison envisioned that his design would meet great success, and that before no time everyone in America would be living in a concrete home. However, his vision did not become a reality as soon as he expected; in fact, concrete homes are just starting to gain popularity now, one hundred years later. Read about the benefits of concrete homes in Building a Home with Concrete. Lynn Mason Scofield founded L.M. 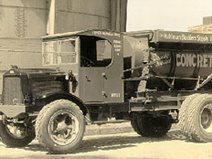 Scofield, the first company to produce color for concrete. 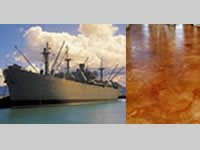 Their products included color hardeners, colorwax, integral color, sealers, and chemical stains. Colored concrete has done nothing but grow in popularity since. Read more about modern colored concrete in Coloring Concrete. 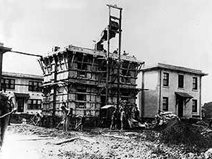 In 1930, air entraining agents were used for the first time in concrete to resist against damage from freezing and thawing. Find out more about air entrainment in Protect Against Freeze Thaw Cycles - Improve Durability. 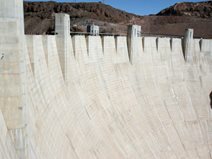 The Hoover Dam, completed in 1936, is located on the Colorado River, bordering Arizona and Nevada. Up to this time, the dam was the largest scale concrete project ever completed. John Crossfield was the first to receive a patent for a concrete overlay. He add latex to portland cement, aggregate, and other materials to make a covering for ship decks. 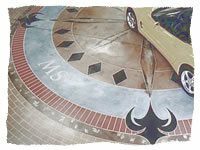 Today, concrete overlays are made by blending polymer resins with cement, and widely used for their decorative appeal. Photo on right of modern concrete overlay, courtesy of Milagro Custom Flooring Solutions, LLC. 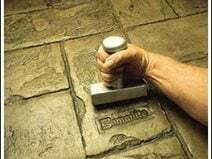 Brad Bowman developed the Bomanite process, the original cast-in-place, colored, textured and imprinted architectural concrete paving, in the middle 1950's in Monterey, California. The fifty years since Bowman's development have seen huge growths in the popularity of decorative concrete, changing it from plain and boring to a beautiful decorative element that can enhance the decor of any home or office. 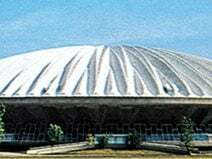 The first concrete domed sports arena, known as the Assembly Hall, was built at the University of Illinois in 1963. 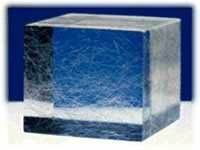 "Fibermesh" is a registered trademark of SI Corporation . Fiber reinforcement was introduced as a way to strengthen concrete. Buddy Rhodes, the father of the concrete countertop, cast his first countertop in the mid '80s. Around the same time, Fu-Tung Cheng also cast his first concrete countertop. In the twenty years since, concrete countertops have become incredibly popular due to their durability, beauty and range of customization. 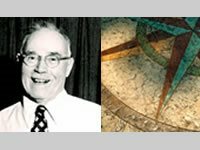 Darrel Adamson designed the Engrave-A-Crete ® System in 1990. Learn more in, What is Concrete Engraving?. Or watch a video of Darrel Adamson talking about his business and how he came up with the idea of concrete engraving. The tallest reinforced concrete building was built in Chicago, Illinois. 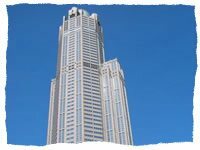 The 65-story building is known only by its street address, 311 South Wacker Drive. HTC, originally a Swedish company, introduced concrete polishing to the United States. The first installation in the US was a 40,000-square-foot warehouse floor for the Bellagio in Las Vegas. 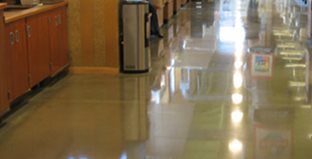 The popularity of polished concrete has soared in just the few short years it has been around, it is now being used in retail locations and even residential homes. Find out why it is so popular in our Concrete Polishing section.